Hawaii National Park is the world's classic of living volcanism. It is a gentle land and a hard landof brooding silence and explosive violence; of enchanting wilderness and barren desert; of pounding surf and lofty mountains; of gleaming snow and never-failing summer. It is a changing landnew and fresh and awesome. The park is divided into two parts, the Kilauea Section, on the Island of Hawaii, and the Haleakala Section, on the Island of Maui. Web Edition Note: The former Kilauea Section of Hawaii National Park is now known as Hawai'i Volcanoes National Park and the former Haleakala Section is now known as Haleakala National Park. The Kilauea Section includes mighty Mauna Loa, a vigorous volcano and the world's most massive mountain, and Kilauea, one of the world's most consistently active volcanoes. The Haleakala Section includes Haleakala Crater, a riot of color seven miles in diameter and 3,000 feet deep. Hawaii National Park is your National park. 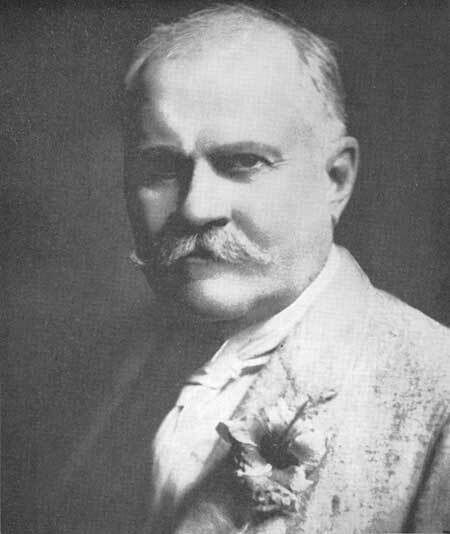 Lorrin A. Thurston, the "Father of Hawaii National Park." Principally through his efforts, the Land of Pele was brought into the select family of the National Park System (Post, Honolulu). The Pacific is a big ocean: it covers more than one-third of the earth's surface and more area than all of its land. It stretches more than 10,000 miles from Panama to the Philippines and almost as far from the Bering Sea to Antarctica. The Pacific is the mother of oceans, the setting of romantic and moonlit isles, the hunting ground of explorers, buccaneers, and traders, the battleground where an empire bent upon world conquest was vanquished by a nation determined to preserve its cherished freedoms, and the home of the Polynesians, a hardy breed of people whose beginnings are obscure and full of conjecture. Three distinct regionsPolynesia, Micronesia, and Melanesiamake up the Pacific world. The designation Polynesia is derived from the Greek nesos, an island, and poli, many. Largest among these regions is Polynesia, which forms an almost perfect equilateral triangle with Easter Island at the apex, Hawaii at the left corner of the base line, and New Zealand at the right. The distance between each point of the triangle is between four and five thousand miles. The islands of the Pacific number into the thousands and range from shoals and atolls to mighty land masses. They are commonly identified as continental or oceanic islands, depending on the geological story they tell. Continental islands are geologically parts of the continental platforms, for their rock types and structures are similar to those of the continental land masses; oceanic islands, generally the product of volcanism, are far removed from the continents and differ in geological structure with the continental land masses. Stretching from northwest to southeast for a distance of 1,500 miles across the Pacific lie the Hawaiian Islands, where Nature blended a forerunner to paradise. The archipelago was built by sustained and prodigious volcanic activity that probably began some sixty million years ago through a series of fissures in the ocean floor. The islands represent the tops of an enormous submarine mountain range. Wind, rain, surf, and other agents have eroded some of the islands into small remnants that project only a few feet above the surface of the ocean. The Hawaiian Archipelago consists of eighteen islands, reefs, shoals, atolls, and pinnacles varying in size from 4,030 square miles to a few acres. Largest in the group is the Island of Hawaii, which boasts two of the world's most consistently active volcanoes, the highest insular mountain, and the largest single mountain mass. Smallest of the lot is Gardner Pinnacle, a stack of volcanic rock of three acres. The timeless buildup of the islands continues, and if one could have a glimpse into the future he would probably see new islands thrusting their tops above the ocean to the southeast. Plant spores and seeds borne by currents, winds, and migratory birds eventually found their way to these once barren islands and mantled them with a carpet of vegetation. The native birds were probably blown in by strong winds; the Hawaiian bat and seal, the only native mammals, probably came in under their own power; and the pig, dog, and other animals and plants were introduced by the first settlers. The coconut may have been brought by the early voyagers or it may have been carried by ocean currents. Into these isolated and far-flung islands came the hardy Polynesians, who had ventured into the unknown fastnesses of the vast Pacific in search of a homeland. Their conquest of the Great Ocean and its far reaches is one of the most remarkable achievements in the pageant of life, but little is known about it. In Hawaii, the Polynesians found an extravaganza of colora land at once gentle and harsh, a land of freshness, primitive and untouched, of deep canyons and lofty mountains and fertile valleys and abundant forests. Nature had given generously of her best in creating such a masterpiece. The uplands provided logs for their canoes and stone for their primitive tools; in the waters surrounding the islands they found an abundance of food, in the valleys, rich and productive lands for their agriculture. And on the summit of a volcano they found Halemaumauthe abode of their goddess Pele. Of it some made a shrine, a place of pilgrimage and prayer. While the homage paid to Pele was inspired essentially by fear, it was nonetheless worship, and they immortalized her in song and dance and in legend and tradition. Hundreds of years later, a wise government set aside a part of her land as a national park, to be preserved for the benefit and enjoyment of all people for all time. The Land of PeleHawaii National Parkis located on two of the principal islands of the archipelago, Hawaii and Maui. That part of the park on the Island of Hawaii is known as the Kilauea Section, that on Maui as the Haleakala Section. The Island of Hawaii, by far the largest in the group, was formed by five volcanoes, Kohala, Hualalai, Mauna Kea, Manna Loa, and Kilauea. Kohala and Mauna Kea are considered to be extinct volcanoes; Hualalai, which last erupted in 1801, is dormant; and Mauna Loa and Kilauea are among the world's most consistently active volcanoes. Both are included within the Kilauea Section of Hawaii National Park. The outstanding features of the Kilauea Section are its two active volcanoes, luxuriant rain forests of hardwoods and giant tree ferns, spectacular palis (cliffs), rugged coastline, a desert, and other values. Kilauea (meaning "rising smoke cloud," according to Andrews) is a shield volcano built by lavas from countless eruptions occurring along its flanks and summit crater. Rising some 4,000 feet above sea level, the mountain nestles against its neighbor, mighty Mauna Loa. In the prehistoric past, the summit of the mountain collapsed, leaving a crater some two miles wide and two and one-half miles long. Within this crater is Halemaumau, Pele's sanctum sanctorum, a yawning pit 3,100 feet in diameter and, 460 feet deep. The unique crater within a crater is the principal Kilauea Volcano lava outlet and in periods of activity sustains typically a boiling lake of lava. It is the world's only drive-in volcano, for visitors can drive their automobiles to within two hundred feet of its rim and gaze at the sublime and awesome spectacle it presents. For one hundred years between 1823 and 1924, the fires of Kilauea Volcano burned over sixty-six percent of the time. In 1934 it entered a period of semi-dormancy that lasted until June 27, 1952, when it began what suggests a new eruptive phase. The floor of Halemaumau stood 770 feet below the rim of the crater before the outset of the 1952 eruption. In 136 days of activity, some 64,000,000 cubic yards of lava were deposited in the pit, raising the floor some three hundred feet on the average. Mauna Loa, meaning "long mountain," the graceful, sloping Colossus of the Pacific, is also a shield volcano. It measures some ten thousand cubic miles in size, or approximately one hundred times larger than California's Mount Shasta. Its two rift zones and summit crater, Mokuaweoweo, meaning "island of lurid burning," have been the scenes of thousands of eruptions in the volcano's long history. The prodigious quantities of lava produced by Mauna Loa have built it into the largest single mountain mass on earth. Measured from its base, 18,000 feet below sea level, to its summit13,680 feet above sea levelit stands higher than Mount Everest. In the hundred-odd years that western man has observed it, Mauna Loa has erupted on an average of once each three and one-half years. The Haleakala Section of Hawaii National Park encompasses the summit area of Haleakala Volcano. which last erupted some two hundred years ago. The principal feature of this section of the park is Haleakala (meaning "house of the sun") Crater, a colorful depression seven miles in diameter and three thousand feet deep, one of the most spectacular holes in the world. Massive cinder cones in the crater are eloquently silent reminders of the earth-building might of this dormant volcano. A modern surfaced highway leads to the highest point on the crater rim, which is over 10,000 feet above sea level. Foot and horse trails wend their way from the rim to various points on the crater floor, a hiker's paradise. The rare silversword, one of the most spectacular plants in the world, grows abundantly in this section of the park. In addition to the crater, the summit of Haleakala commands a magnificent view of the Island of Maui, whose broad expanses of sugar cane and pineapple fields spread out almost two miles below to blend with the sculptured cliffs of the West Maui Mountains, which rise abruptly from the plain to a height of nearly 6,000 feet. The neighboring islands loom to the north and south like jewels in the shimmering beauty of the Pacific. Amidst the splendor of these impressions, one cannot help feeling grateful that he is able to see and feel. 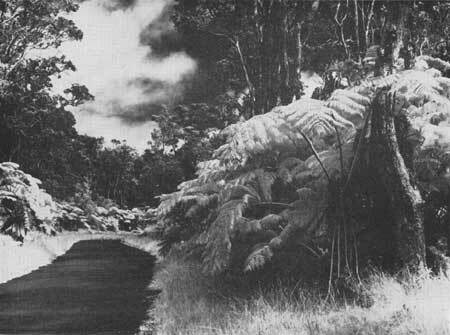 Along the scenic Fern Jungle in Hawaii National Park (National Park Service).